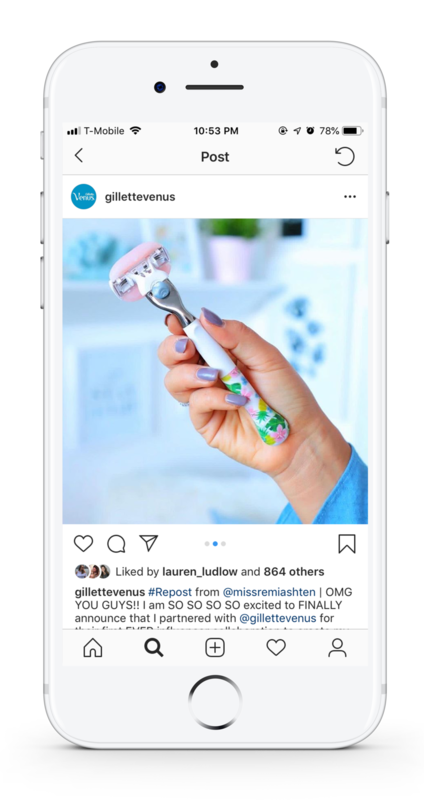 Gillette Venus partnered with beauty + lifestyle YouTube star and entrepreneur Remi Ashten (@missremiashten) to launch a first-ever limited-edition razor. To reflect her energizing positivity + bright personal style, we teamed up with her to create a vibrant tropical print to sell exclusively through Gillette Venus Direct subscription service. I was tasked with adapting a print design to fit the style of Remi and her brand, and design side-by-side with her to make sure her vision would come to life. Each pattern on the razor is unique and unlike the other. After the launch of the razor, I was tasked with capturing and producing content that reflected the essences of the razor and to showcase that no two are alike. Each pattern was unique and unlike the other, My responsibilities included ideating, art directing, prop styling and photographing the razors. With the launch of the new Venus Platinum Razor, Face Precision Trimmer, and Bikini Precision Trimmer, the ask was to capture and produce content that created a vibrant, high quality look to reflect the modern and sleek form factor of the products. While staying close to the Venus brand book guidelines, the products served as the hero by using super white backgrounds grounded in soft shadows with pops of Venus’ true brand colors. The use of minimal objects within the compositions feel strong and sturdy while laddering up to the products’ elegant attributes and premium feel. I was tasked with everything from ideation, art direction, photography, animation and prop styling of each piece.